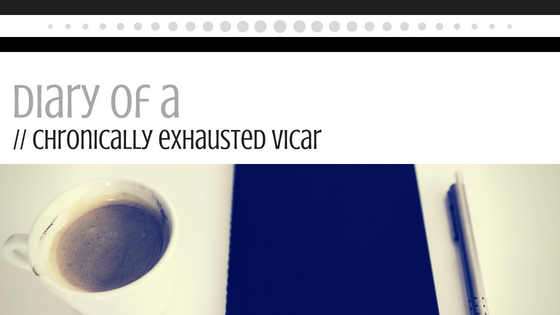 Diary of a chronically exhausted vicar. Episode 15. Three days into two weeks of enforced rest, I have achieved a lot. A lot of sleep, that is. I have completed a jigsaw puzzle, too. Done some cross stitch, watched some tv shows and movies, did some shopping on line, washed dishes a few times, answered emails and texts and messages from, and talked on the phone with, lovely people who care about me, and today I have even managed to put some sheets and towels through the wash and hang them on the line to dry. Those are the small things we do every day, mostly, without even thinking about it. But. I feel flat, depleted, and still so incredibly tired. I ache, from my glands to my head and my muscles all over. I have achieved a lot. But not what I need to, not yet. I have not yet begun to heal, to recover some energy and clear thinking and sense of wellbeing. Two weeks of complete rest sounded a lot on Monday in the doctors’ surgery. Three days in, I’m beginning to think she might have been right.